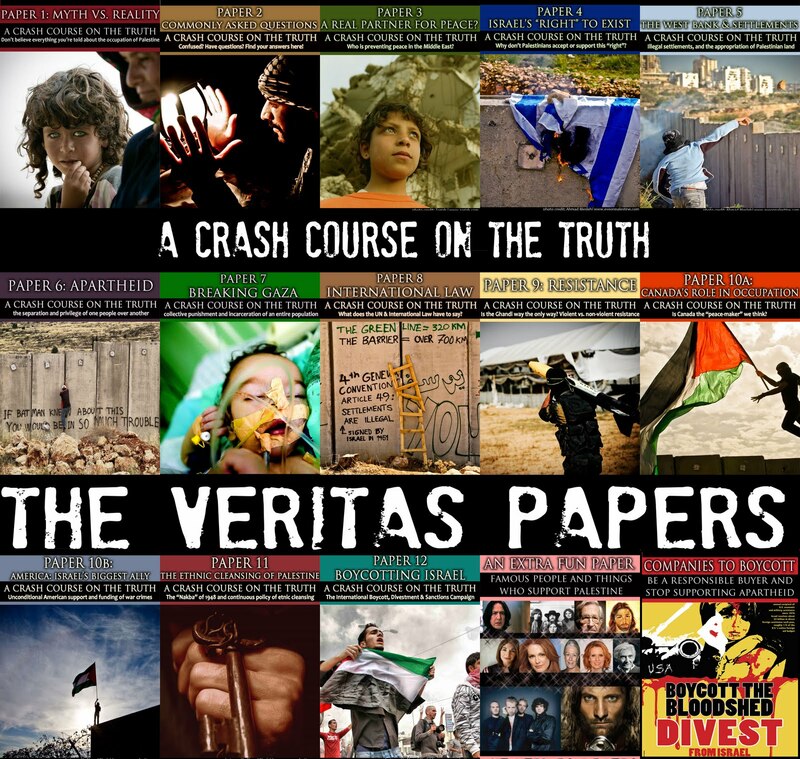 We are pleased to announce the launch of our newest publication: The Veritas Papers. They are a set of 15 pamphlets that cover a wide range of issues from the ethnic cleansing of Palestine to the boycott movement to celebrities who support the cause. Each of the pamphlets can fit on a single letter-sized page. They are available for a free PDF download and we highly encourage all to print and distribute them as widely as possible. We also made a mildly entertaining youtube video to spread the word. One of the most difficult aspects of outreach is finding appropriate materials that a general audience will find interesting and informative. 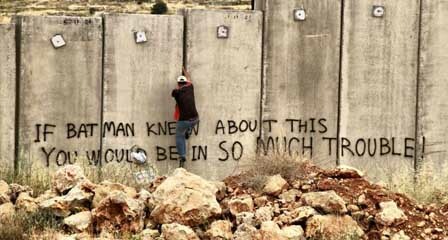 The history is indeed detailed, however, the problem is pretty simple in that it is the story of the occupied vs. the occupier. 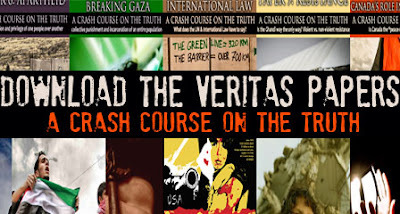 When we released The Veritas Handbook in July 2010, one of the most common things the editor heard was “Whaaaat…. 347 pages? !” For these (lazy) individuals, and those completely uninformed, we decided to release The Veritas Papers, something much shorter and accessible. When reading and distributing The Veritas Papers, we ask you to keep in mind the words of Rafeef Ziadeh, who, in her (excellent) piece titled “We teach life,sir” says:“Today, my body was a TV’d massacre that had to fit into sound-bites and word limits filled enough with statistics...” The Palestinian struggle cannot be limited to, nor demeaned to fit a few pieces of paper. It cannot fit into word limits and papers.This is a human struggle, and no words can do it justice. What makes The Veritas Papers stand out amongst other pamphlets, is their accessibility and attractiveness. Each of the papers has been designed to print on a single letter-sized paper (on both sides), in a booklet format, and they look pretty good. There is a grand total of 15 papers including addenda. Paper 4: Israel's "Right to Exist"
We have designed them in colour (so they look pretty good, if we do say so ourselves)—but they also print pretty nicely in black and white. Fact Checked: Due to the space limitations on an 8.5x11 piece of paper, our references are linked on our website instead. Send all doubters there! The website contains links to the resources used in each paper and we hope that this will make our work more accountable and reliable. In case you don’t remember us…. 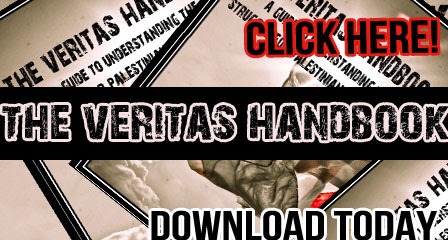 The Veritas Papers were released by The Veritas Handbook: A Guide to Understanding the Struggle for Palestinian Human Rights. Check it out! These papers can hardly be called an introduction. Rather, the purpose of these papers is to garner an interest for people to educate themselves on the occupation. There are so many subjects that still need to be covered, including media, prisoners, refugees, children, solutions, access to resources and more. We hope to cover these in the soon future. 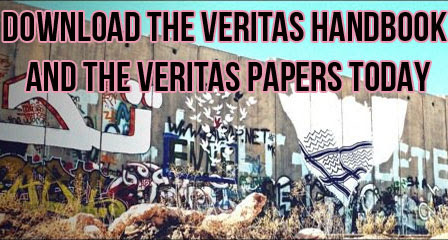 We hope that The Veritas Papers will benefit Palestine solidarity movements and we look forward to hearing your feedback. We have created a survey and would love to hear your thoughts and feedback. Please fill it out by clicking here. And don't forget to spread the word, far and wide, across the globe! Check out our promotional YouTube video by clicking here! We've tried to make downloading the files as easy as possible. If you would like to read the papers online without having to download them, please go to the individual pages for each of the papers below. 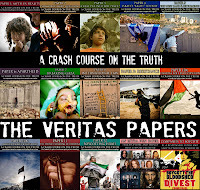 Download all of The Veritas Papers (15 files, 12.2 MB) from Google Docs (hit "download original" at the top right-hand corner to download ALL of the files in a zip document) by clicking here. Please note that if you get error messages on the Google Docs file, that you try again. Due to the size of the file, there are times when Google will give an error message, probably due to traffic. We have tried our level best to provide a free download avenue and so that everyone can freely access the files or at the very least view them online. Download individual papers from Google Docs. View the collection here and choose which papers you would like to download (again, hit "download original" at the top right-hand corner of each paper) by clicking here. If you have a scribd account, you can also view the Veritas Papers on there. Printing: If you would like to print the Veritas Papers, please download the original PDF files (from the Google Docs above) and follow these printing instructions. Sources: You can view the sources for all of the papers by clicking here. Alternatively, you can read the sources at the bottom of each page (in the links below). · 150 American actors, directors etc. 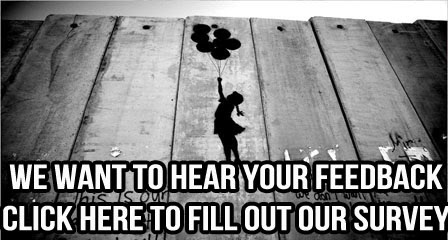 sign on to the boycott of illegal settlements. · Coldplay endorsing the song and facebook removal. o “Words I never Said” – song that includes lyrics about Gaza getting bombed. o Read his books or articles and you’ll get a better impression of this vociferous critic of Israel who was recently barred from entering Israel because of his political views. o Some people may have found this addition a little odd, but we believe it. Jesus, as a lover of humanity and justice, without a doubt, supports the Palestinian plight for justice. o Support the kaffiyeh factor! Buy your authentic Palestinian kaffiyeh here. Correction and Updated Version: Since we were researching and creating these documents for awhile before the publication, we just realized that the former CEO of HP who is mentioned in the leaflets is no longer the CEO of HP (he ceased to be late 2011, after we had completed our research on the company). Nevertheless, HP continues to have an intimate relationship with the Israeli military. We also noticed something a little weird going on with the font, and have corrected the formatting. Please note that this is the only reason for the updated versions. ** Companies with a star next to them have been independently researched by The Veritas Team and findings are posted on the links. · Famous People: See the addenda for details on famous people who have endorsed the boycott. Click here to read more! Sources for Paper 10: A Real Partner for Peace? · "The Palestine Papers" were released by Al-Jazeera. o Israel (all areas according to the CIA Factbook): 20 770 sq km. o Report by the Institute for Middle East Understanding, fully referenced, see the article for more references. o Also see: Israeli Military Strength by Global Fire Power (the reference cited is the CIA, but we were unable to independently confirm the veracity of this source).